The AOC AG241QX is a gamer targeted monitor that offers up 144hz refresh rate and FreeSync compatibility all wrapped up in a 24″ package. The more remarkable specification of this display is the 1440p resolution on this size screen. 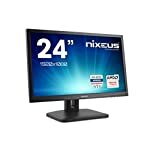 I have nothing against 24″, I recently bought two such sized monitors myself, but 1440p might present some problems. Unless the applications you use are properly scaled any displayed text will appear on the small size. That might not be a problem for you, I work with many professionals who enjoy working with absurdly small text, but you have been warned! Windows is getting better at scaling, it’s easy to upscale the font size within the OS, but it’s not something I’ve had to do myself so can’t comment on how effect it is. I’d love to hear back from anyone with more experience. Either way, the AG241QX is going to present crystal clear super sharp images thanks to the high pixel density provided by the QHD resolution. The AG241QX has reasonably slim matt black plastic bezels and a unique looking solid stand. The forked v shaped design provides a wide supportive base without taking up all the available room on your desk. It’s not just aesthetics though, this stand also provides tilt (3.5° forwards, 21.5° backwards), swivel (20° left, 20° right), height adjustment (130mm) and pivot (90° clockwise rotatio). The monitor itself is suitably slim and a pleasing design overall. Round the back you’ll find a 3.5mm headphone jack, 3.5mm audio input and 2 USB 3.0 ports. These ports are positioned on the right side and are more accessible than most. 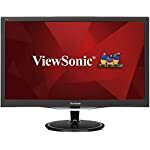 Slightly less accessible, you have plenty of choice when it comes to hooking up the monitor to your graphics card, Dual-Link DVI, HDMI 1.4 port (with MHL), HDMI 2.0, DP 1.2a (supports Adaptive-Sync), VGA are all available to you. Less pleasing is the medium matte anti-glare screen surface which has a fairly grainy surface texture. The 23.8 inch TN panel, part AU Optronics M238DTN01.0, offers true 8 bit colour without dithering. Professional reviewers report back rich overall colours with a rich and vivid gaming experience. Input lag tests come up well on this model, you’ll have no problem feeling connected to your game play. Some noticeable weakness in terms of pixel responsiveness has also been observed, this adds to the perceived blur and provided some trailing in tests. The FreeSync range of 30-144hz is actually decent, other monitors don’t kick in until higher frame rates. This means that as long as your PC can output over 30 frames per second you’ll be protected from screen tearing. This technology does make a practical difference and eliminates juddering and tearing when enabled on your AMD graphics card. Remember, if you want to get the most out of this monitor and push it up to the full refresh rate at native resolution, with FreeSync, you’ll have to have this running through DisplayPort. HDMI 2.0 can run 2560 x 1440 @ 144Hz but you won’t get FreeSync. So what’s 1440p like on a 24″ monitor anyway? This resolution at this size gives you a pixel density of 123.41 PPI. To put that in perspective, on a 27″ model you would have 108.79 PPI. Higher isn’t necessarily better when it comes to pixels and just over 100 is normally a good sweet spot. The more pixels you have the harder your graphics card has to work to get any performance. You also have the problem that text may look smaller than intended if not scaled up. That said, the difference between this and 1080 is relatively subtle and not as significant as an UHD (4K) resolution. The extra pixel density offers a pleasing enhancement to image quality, assuming your PC is up to the challenge. You can run the monitor in 1080p if you wish and you’ll find it very much usable even if there is some softening of the image due to the interpolation process. We give the AOC AG241QX a 4.5 out of 5 rating. Want to know what existing owners of the monitor think? You can read real user reviews here. 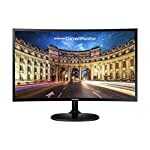 Should I buy the AOC AG241QX? A rare 1440p 144hz offering wrapped up in a 24" package. Low input lag and high refresh rates make this appealing to gamers. If you are having some doubts about this purchase then why not read some real owner reviews and see what other buyers think. Welcome to the AOC AG241QX FAQ. This section attempts to answer common questions you may have, please get in touch if you have any more queries or if you think our answers need updating. Does this have DVI connectivity? It sure does, it even has VGA too. But remember, these older connectors are limited in bandwidth so you won’t be able to run at full res at 144hz with FreeSync on these antiquated standards. Time to upgrade that graphics card! Any good for ps4/ps4 pro? 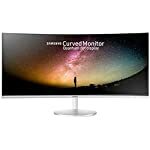 You can run this monitor at 1080p and should find it usable. The interpolation process will have some impact though so it will never look quite as “sharp” as a native 1080 screen. What's that aerial like thing sticking out the side? It’s a headphone rest. Don’t worry it can be moved out of the way so it is firmly out of sight.